One of the most fundamental truths of investing is that you can't time the market. Even so, it's natural to wince a little when you buy an investment only to see the price drop, or sell only to see the price rise. One approach that might help alleviate some of your concerns is dollar-cost averaging. Dollar-cost averaging involves investing a fixed amount on a regular basis, regardless of share prices and market conditions. Theoretically, when the share price falls, you would purchase more shares for the same fixed investment. This may provide a greater opportunity to benefit when share prices rise and could result in a lower average cost per share over time (see chart). If you are investing in a workplace retirement plan through regular payroll deductions, you are already practicing dollar-cost averaging. If you want to follow this strategy outside of the workplace, you may be able to set up automatic contributions to an IRA or another investment account. 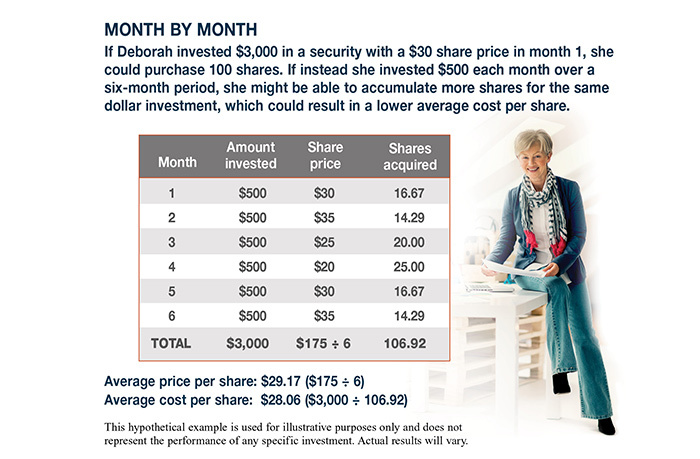 Or you could make manual investments on a regular basis, perhaps choosing a specific day of the month. Dollar-cost averaging does not ensure a profit or prevent a loss, and it involves continuous investments in securities regardless of fluctuating prices. You should consider your financial ability to continue making purchases during periods of low and high price levels. However, this can be an effective way to accumulate shares to help meet long-term goals. All investments are subject to market fluctuation, risk, and loss of principal. When sold, they may be worth more or less than their original cost.